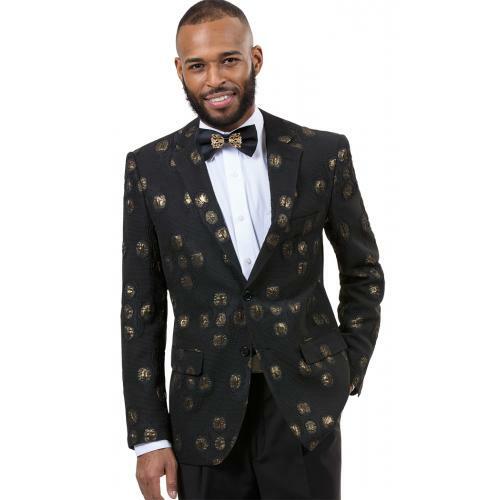 Home/ All Custom Orders/ E. J. Samuel Custom Suits/ E. J. Samuel Black Abstract Classic Fit Blazer J36. E. J. Samuel Black Abstract Classic Fit Blazer J36. "This Blazer is from an in-stock selection provided by manufacturer. Prior to shipping this Blazer to you, we will inspect the Blazer for quality purpose. Please, allow an additional 7-9 business days in order to receive your Blazer." E. J. Samuel is well-known for its high-fashion trendy Blazer. If you are the kind of person that likes to "set the trend" and not "follow the trend," then this is the Blazer you need! This beautiful poly/rayon Blazer is designed by E. J. Samuel and features all the unique custom works that you'll find only in a tailored made Blazer. E. J. Samuel's main focus is aggressive high-profile men's fashion dress wear that will turn heads.